I am busy getting ready for my high school age son’s study of Modern History. We sat and discussed how he would like to document his reading and research and his choice was notebooking and a timeline. I knew just where to go for some help! Having a membership in NotebookingPages.com’s Treasury is like having a whole notebook page store at your fingertips. I literally found what we were looking to use in a matter of two minutes. We decided the Book of Centuries pages were perfect and using the Modern Times set I printed out, hole punched, and inserted his whole first term’s pages quickly and easily. I know lots of my readers also use NotebookingPages.com’s Treasury and I thought I would share how we are using Book of Centuries pages and you could adapt the idea to your family. These pages would work with any grade level. Here are a few of the ways we used the pages. I printed the title page and spine for the binder cover and this is why I like using the clear view binders. Doesn’t it look great? He will eventually fill in the cover once school is under way. 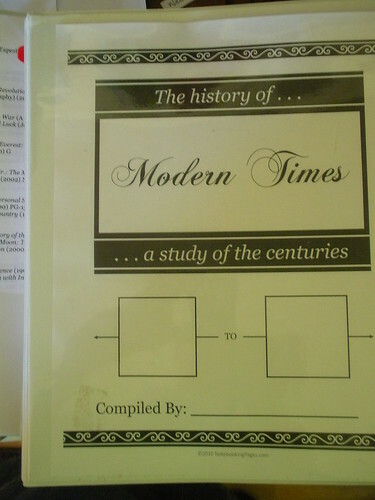 I then went back into the Modern Times set and printed the timeline pages for the 20th century. I hole punched the pages so they are side by side. He will fill in the dates and either draw or use images from the internet to decorate his timeline as he goes through his week’s reading. 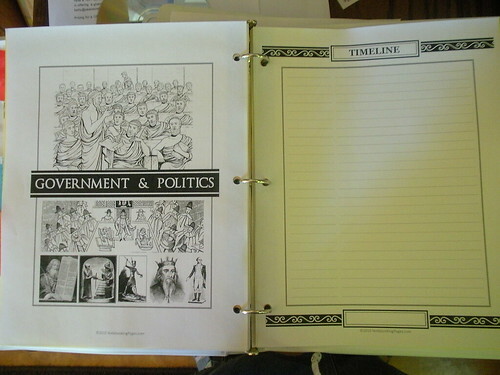 Then he is going to pick two events or topics each week to complete notebook pages for and these will be filed by topic in the back part of the binder under the tabs. 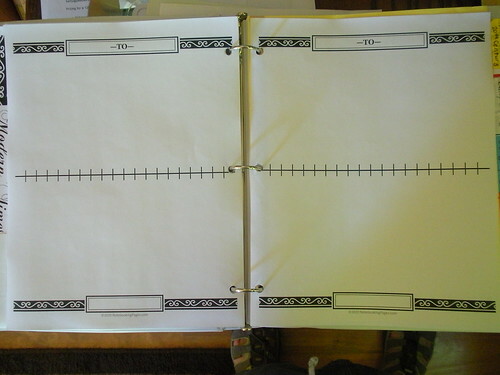 The Book of Centuries comes with these wonderful divider pages and I added a notebook page on the facing page for my son to make a “table of contents” for each section. 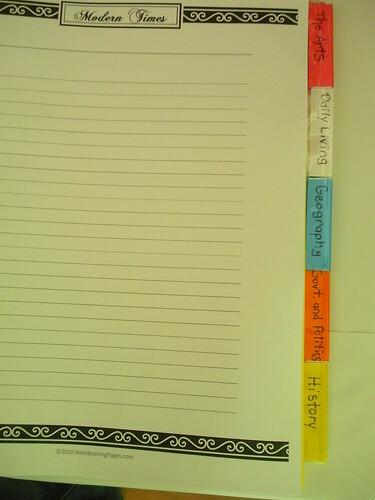 I also added sections with blank notebook pages for the spine history book and the DVD course he will be watching. He will keep notes, maps, quotes, and sketches in these sections each week. This was a quick and easy way to set up his history narrations for the year. If he needs more pages, I will just pull up the NotebookingPages.com Treasury, the Book of Centuries, and find an appropriate page to print for his work. Note: There are Book of Centuries sets for all time periods you might need in your history study. If you would like to read more about how I use notebooking pages in my high school plans, you can read my Notebooking in High School Squidoo lens. I also wrote a blog entry that talks about how to pick content for your notebooking pages in this blog entry: Narration in Our High School Plans. You also may want to read How To Choose Topics. Please note I am an affiliate for NotebookingPages.com and will receive a small commission if you end up purchasing any products using the link above. Love this! I get giddy every time I see that you have a new post, because I know it is going to be good. Thank you! I am going to spend some time looking at this at your squidoo lens! Another great post as I attempt to figure out the way we do history timelines. 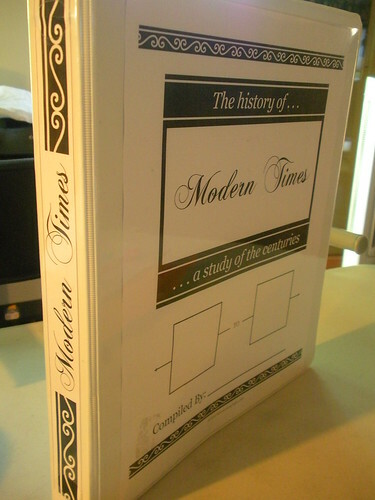 Would you need both the Book of Centuries and the Modern Times pages? What is the difference btwn the two and how are they used differently? Thanks for continuing to guide me along in h/s. The Book of Centuries set (all time periods) is ONLY available to Treasury Members. You cannot purchase them separately. Wow! That looks awesome! Thanks for the inspiration! How would you teach a student to notebook? I have one son who has a hard time writing down “his thoughts” or “what he has learned.” He is 13.5 years old (8th grade) and language skills is an area of learning difficulties. In 6th grade, we did very consistent daily oral narrating. So in 7th grade I tried to get both boys (they are fraternal twins) to do written narrations on some of their readings both for them to record what they read and so I could see that they actually read the assignment. I had started back to work fulltime that year and while their dad was home with them, he wasn’t doing any of the school with them. This son really struggled with the written narrations. When I said “just write what you would tell me if I were here” and encouraged him to not worry about whether the writing was perfect, he still struggled. Fast forward to this year when he is using IEW to work on composition. He recently told me this is THE BEST PROGRAM he has used ever for writing because it helps him figure out what to write and how to write it. I got the feeling that the 2 years we worked on trying to write narrations gave him the “blank page” problem with his writing and he felt like he was hanging in the breeze on his own to figure it out. Any advice on how to teach him to notebook? I think it’s a great tool but just can’t figure out to get him to do it and do it consistently. It doesn’t seem to matter whether he is typing his narrations or handwriting them – they are still a challenge for him. Notebooks are a perfect way to get over the “blank page” problem, especially if he has had some background with IEW. Build on what he knows how to do by starting with a key word outline. Use the kwo to then write a few paragraphs on the notebook page. I do a variety of things with my boys. I use the timeline as a tool in the notebook as well. I have them pick a certain number of events from their history reading to add to the page. I have them pick one of those events and research it and make a notebook page. They summarize readings, speeches, and additional research on nb pages. They use the nb pages to build essays. Use the IEW process with your current curriculum and books. Forgive me if my post is super basic/obvious to experienced notebookers… but: can you tell me if I have the right understanding so i can start this at our house? My son would do his reading for the day. He would file a narration of his reading under the time line century section.Then at the end of the week he would pick 2-4 topics from all that week’s readings to do a notebook page on which would be filed under art, daily living, geography, politics etc? These notebook pages require a little more in depth research on a topic from the weeks reading. he could include on his notebook page maps, drawings, internet clippings, etc to further illustrate a point. Do I have it right? How do you manage (Really – in a practical real world way) making the notebooking page day a hearty real learning experience and not some slapdash page of captions and internet cut and paste just so the student can call it done and have a shortened school day? how do you manage quality control? Thanks so much! love this idea if I have it right! Yes, you have the basic idea right. Notebooking is a way to follow-up on learning, not a fill in the blanks sort of exercise. At the high school level I expect my children to be capable of quality, in-depth completion of any assignment and that includes notebooking. It is a skill that we have worked on coming up through middle school and just continued in high school. It sounds like you might be worried about letting go of the content a bit. Notebooking will not give you one “answer” for a topic and every student can customize his learning to fit his style. Hope that helps and I wish you the best on your road to notebooking. I’m curious as to what DVD course your son took for history? 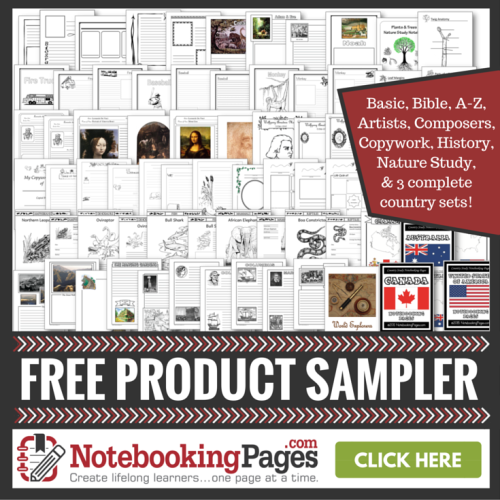 We are starting our second year of homeschooling this month (6th and 8th grade) and I found your site when searching for history timeline notebook ideas. Last year we attempted to use TruthQuest which was not a good fit for us and this year we are going to use Mystery of History. I’m praying it’s what we need. I didn’t like history in school but do now so I would love to instill a love of history in my kids as children. We have listened to historical fiction books for years so I’m hoping that has helped. Before I homeschooled I would give them facts/additional info as we listened to help them learn more. We used a couple of courses from The Great Courses. 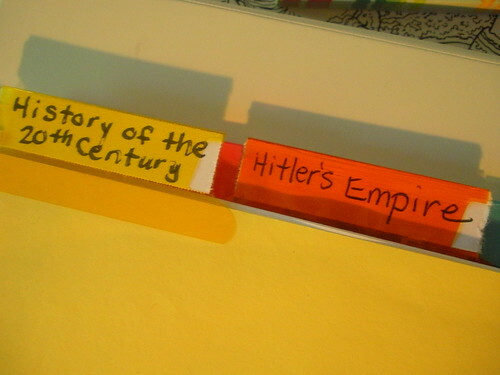 History of Hitler’s Empire. History of the Ancient World. Early American History (high schoool course). We used Tapestry of Grace from 7th grade through 12th. Okay, thank you for answering so quickly. I have heard of Tapestry of Grace but don’t know a lot about it. I’ll have to research it more. I’m going to have to explore your site some more; thanks for the resources! Great post. I am going through a few of these issues as well…..